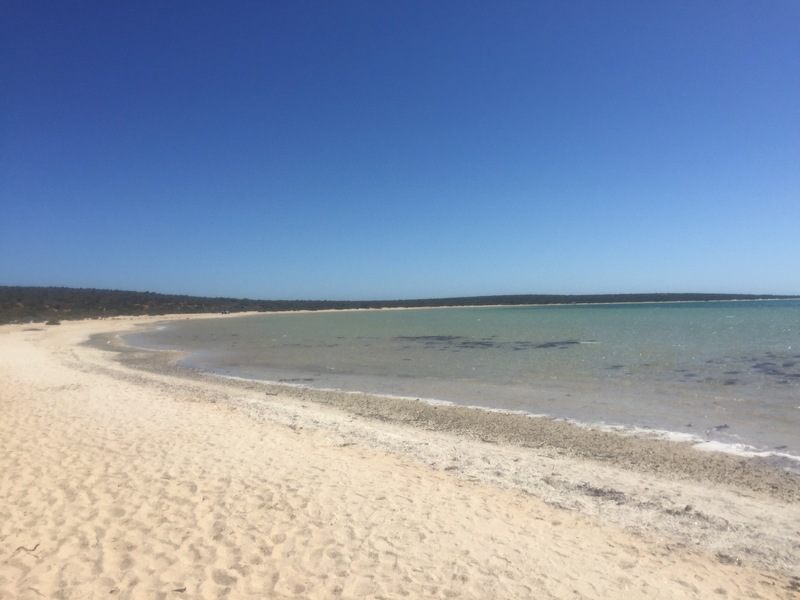 Our next stop along the west coast of Australia was to Shark Bay. 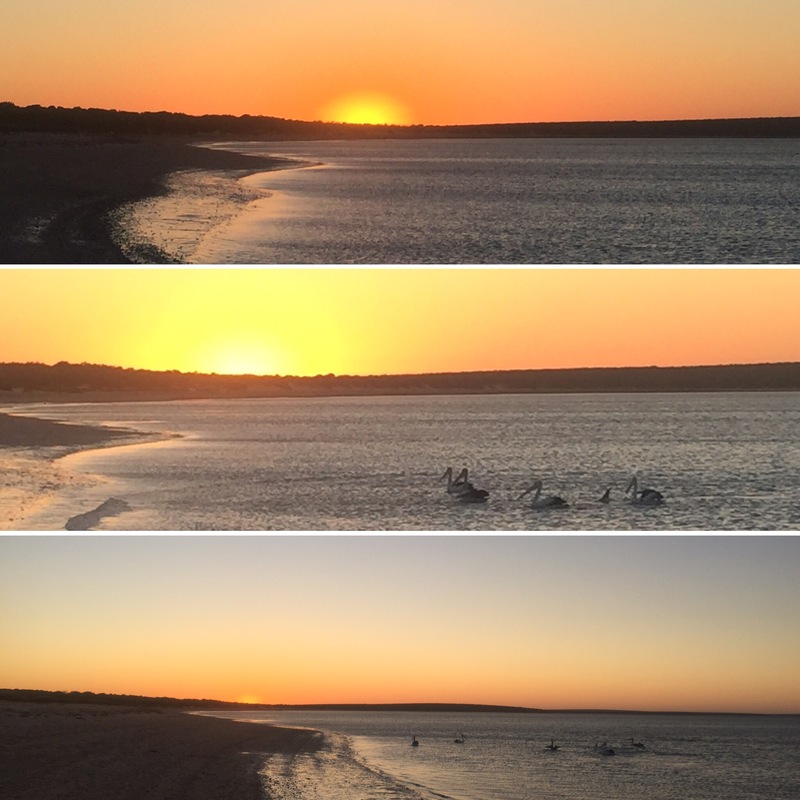 This is a world heritage site and is famous for a place called Monkey Mia. 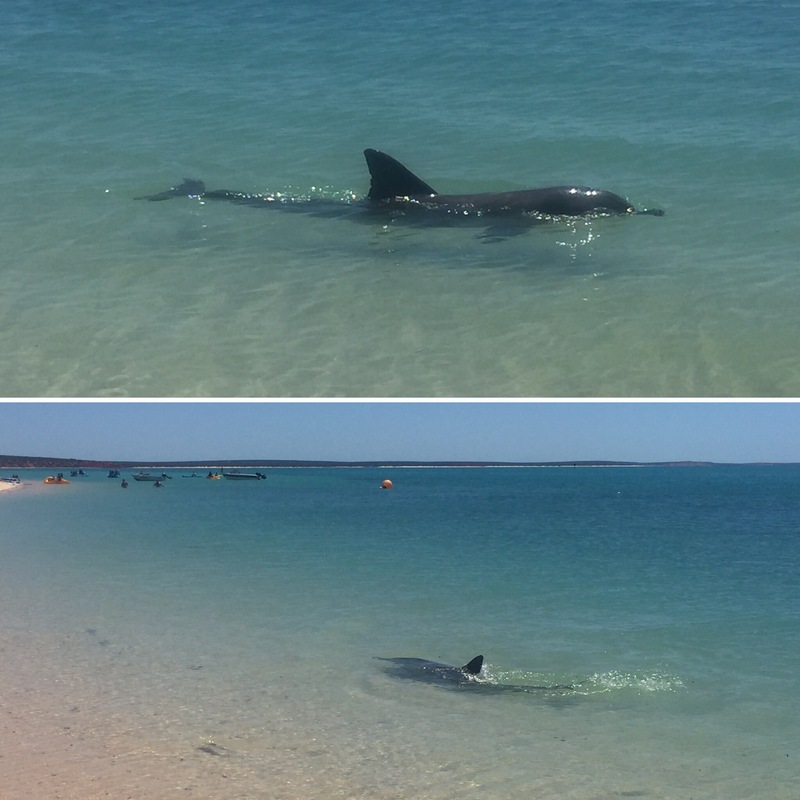 Monkey Mia attracts thousands of tourists (both from Australia and around the world) because it is the home of wild dolphins that, everyday, use the shallows of the beach to fish for food. 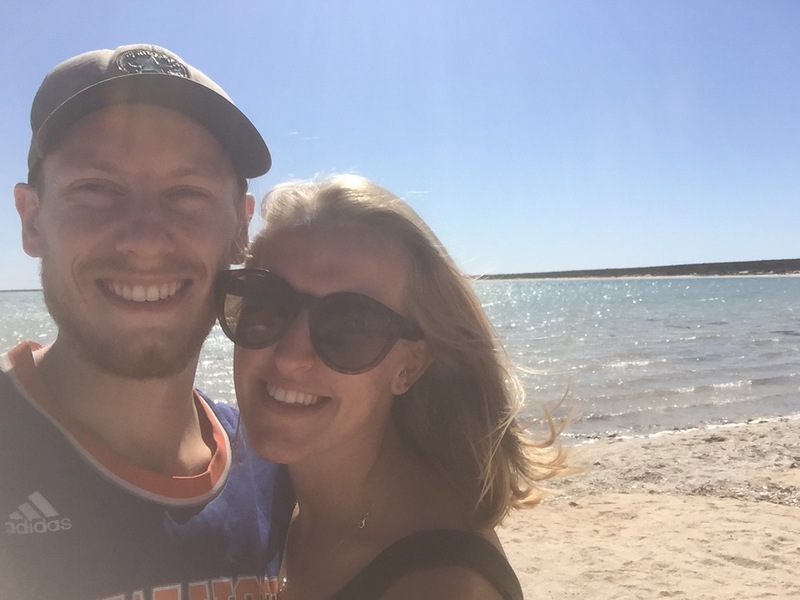 Apparently, dolphins normally move from place to place and aren’t known to stay in the same area all year round which makes Monkey Mia a pretty cool place to go visit. 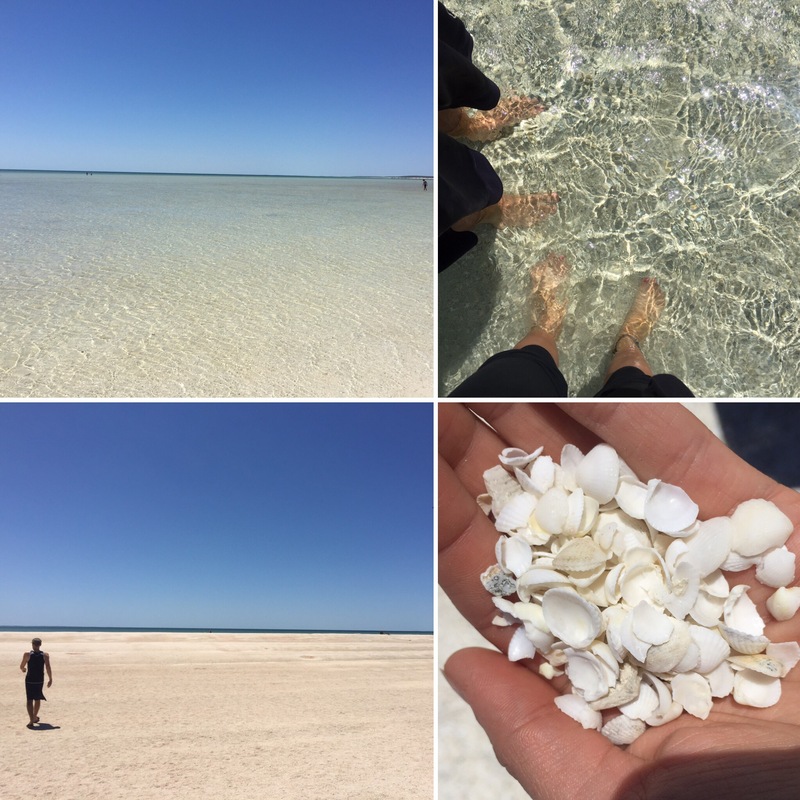 On the way up the peninsula into Shark Bay we stopped at the Shell Beach. This is made up of tonnes of tiny, white cockle shells. The water here is really salty, more so than the rest of the sea, and so not much life is found in the sea here. The water is also really shallow and you can walk out far into the sea without it going past your shins. 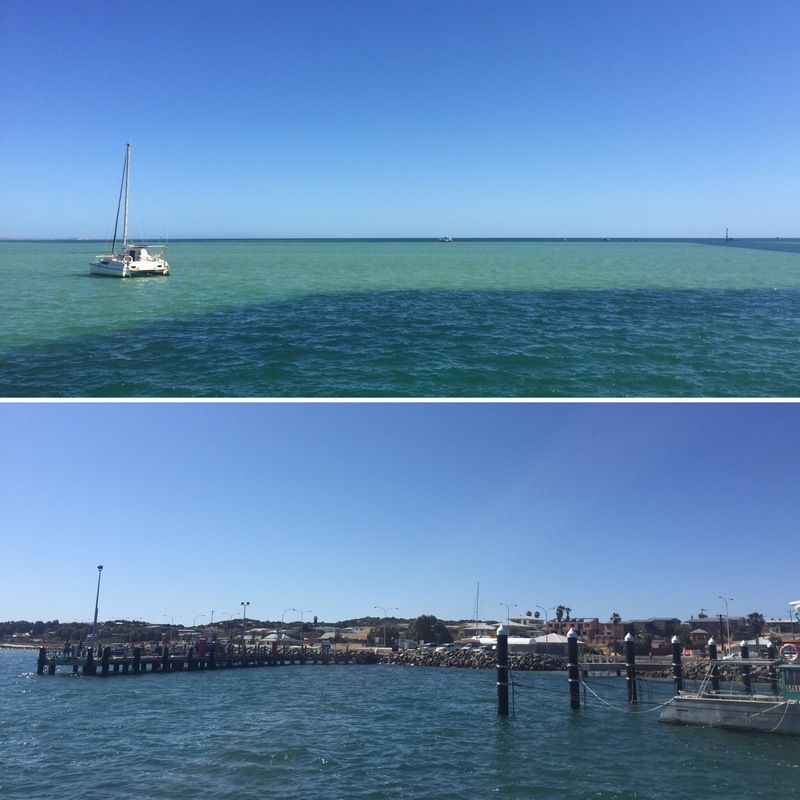 We stopped off in the main town in the area, Denham and were greeted with bright blue seas – something I will never get bored of seeing. Denham is a pretty little town and had a jetty, harbour and boat tours going from the area. We mainly came to go to the information point and work out where we would be setting up camp during our stay. 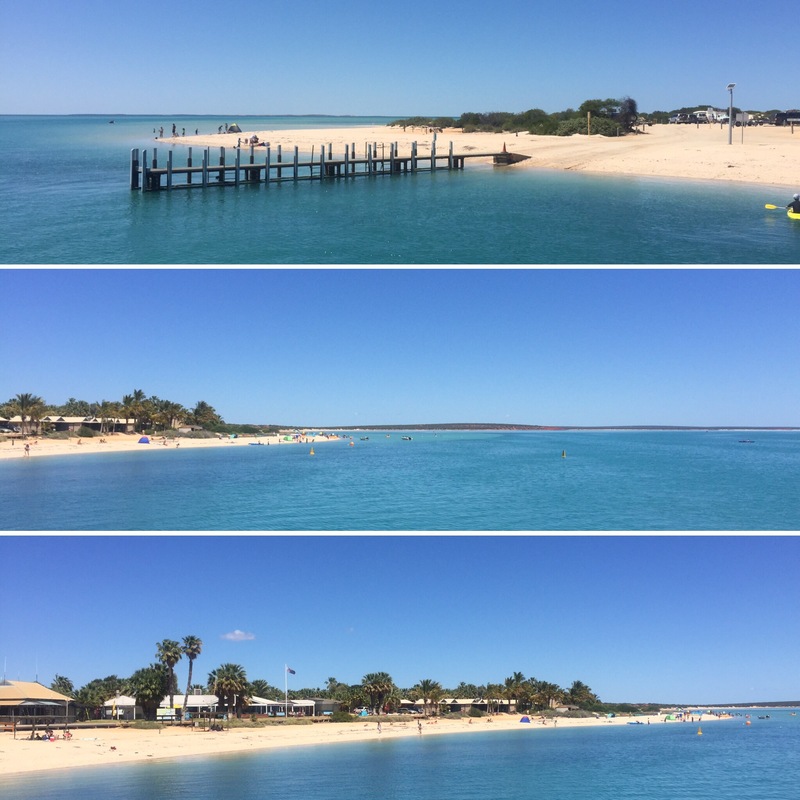 There is no free camping in the area so we booked to stay at the Monkey Mia Dolphin Resort – the only place to stay on Monkey Mia Beach. We got there in the afternoon and so had a few hours to chill on the beach before the sunset. Watching the sun set was amazing as we saw a few dolphins fishing in the shallows. 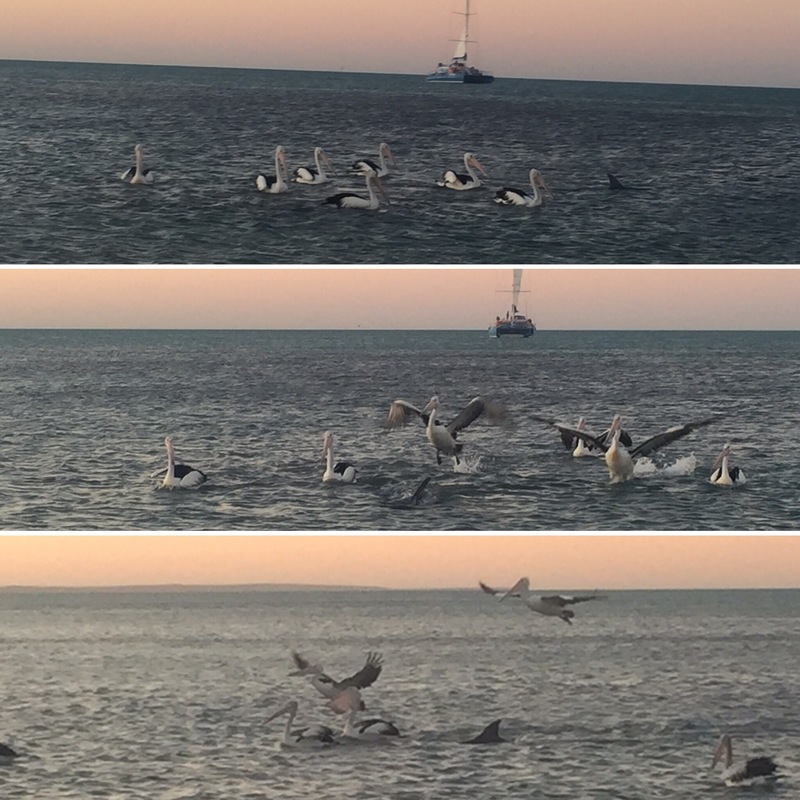 One dolphin was flanked by a flock of pelicans who were trying to steal the dolphin’s fish! It was amazing to see especially with the sun setting in the background. The next morning, at around 7:30am, we headed to the beach for the ‘dolphin experience’. 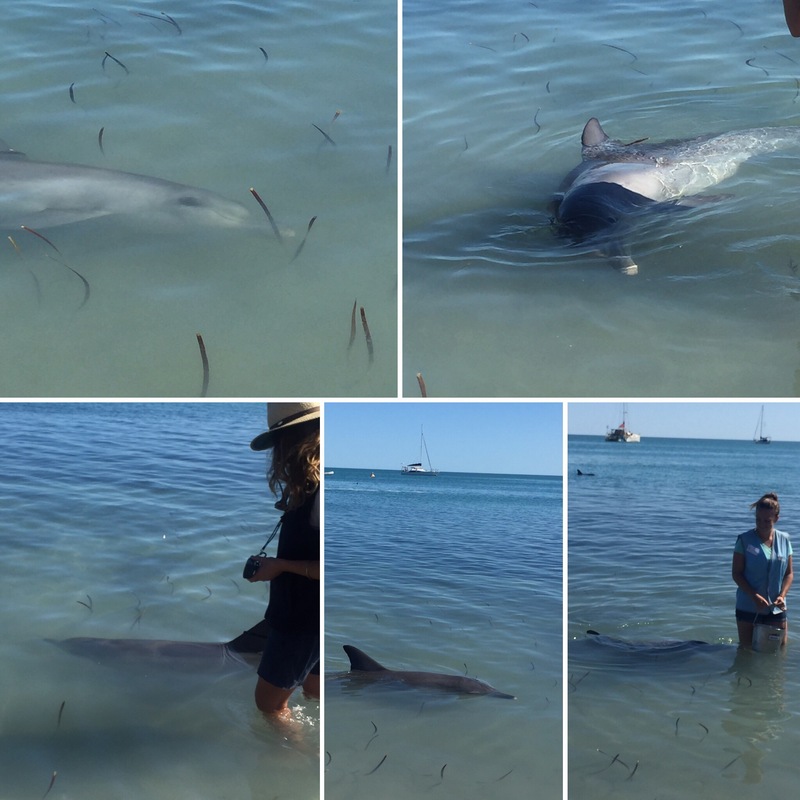 The rangers at Monkey Mia have been given a licence by the government to feed a few of the dolphins a very small proportion of their daily intake of food. 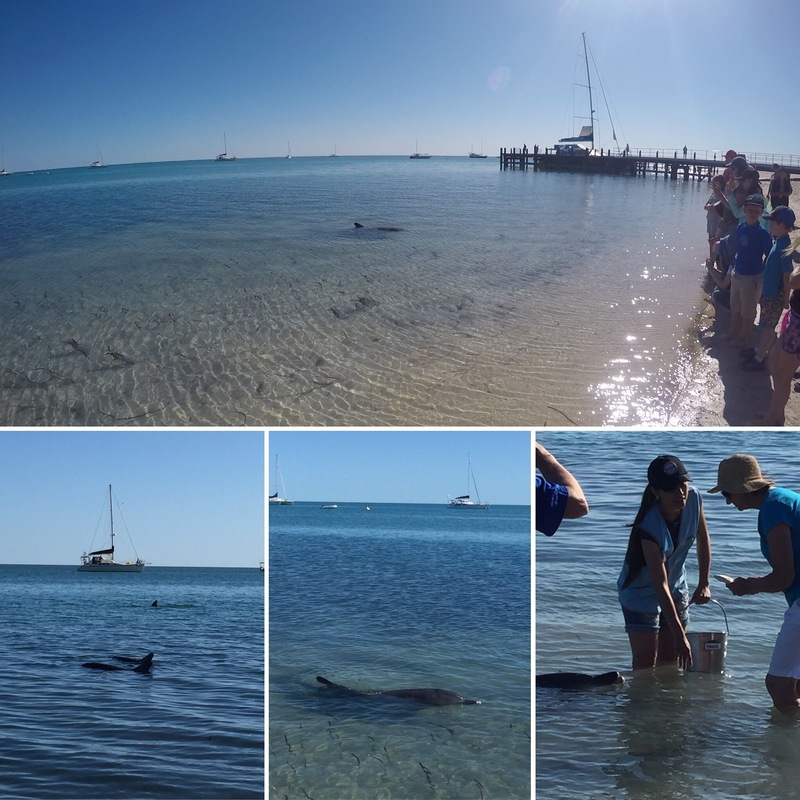 Dolphins have been in Monkey Mia for over 50 years which was a reason why the area was a protected heritage site. We all lined up at the edge of the beach as the dolphins came into the shallows. 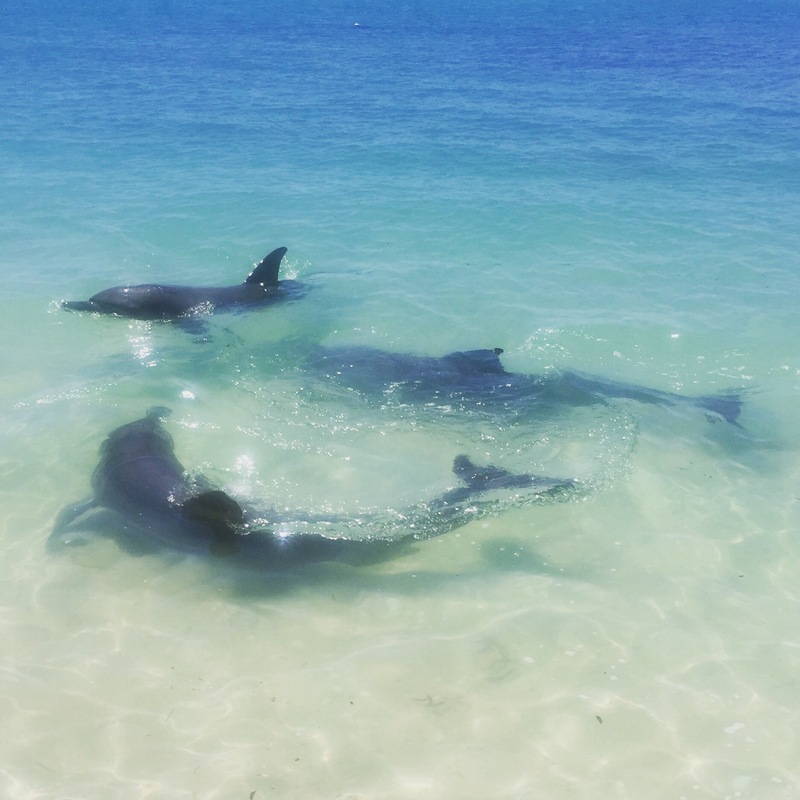 The dolphins are completely wild and come to the shore on their own free will (who would refuse free food?!) and even know where to go ready for the feeding. The volunteers and rangers told us that there are a number of families that are in the area which is really cool and they were all able to recognise the dolphins by their fins. The volunteers line up with the bucket for the dolphins that have decided to come to shore and then they chose people from the crowd to help them feed the dolphins. After the feeding is done we all have to step really far up the beach so that the dolphins will leave and go fish for themselves. There was also a mother with its baby so this was done to make sure the mother would go teach her baby how to fish and not rely on getting food from us humans. The dolphin experience can happen up to three times a day if the dolphins want it to. If the dolphins come back to the feeding area then they will go get more food and another dolphin experience will happen. This happened a second time for us which was good as they came in a lot closer and there was less people there so we could get a better view. It’s amazing how interactive the dolphins are with the rangers and you can tell they have really gotten to recognise who works there and who gives them food. We spent the best couple of hours sunbathing at the beach and were really glad we did as it ended up that a few dolphins decided to come do some fishing in the early afternoon in the shallows. This was incredible to see as people were in the water and the dolphins would just swim around them to get the fish. We got to see three or four dolphins really close up which was nicer than the dolphins experience as they were acting fully wild in their natural environment. 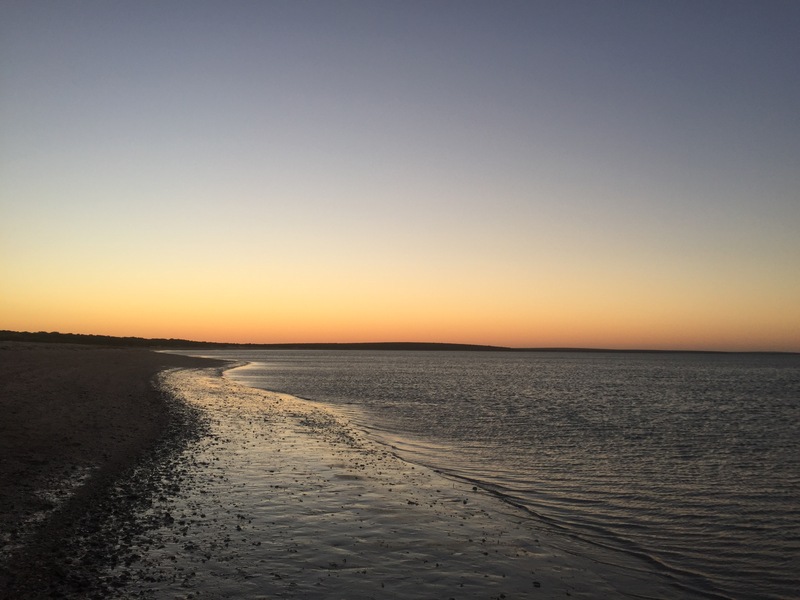 On our way out of Shark Bay, towards our next camp for the night, we stopped off at Little Lagoon. This was a pretty little beach but we didn’t stop there for long as it had gotten quite windy and we had to make sure we got to our campsite before dark. 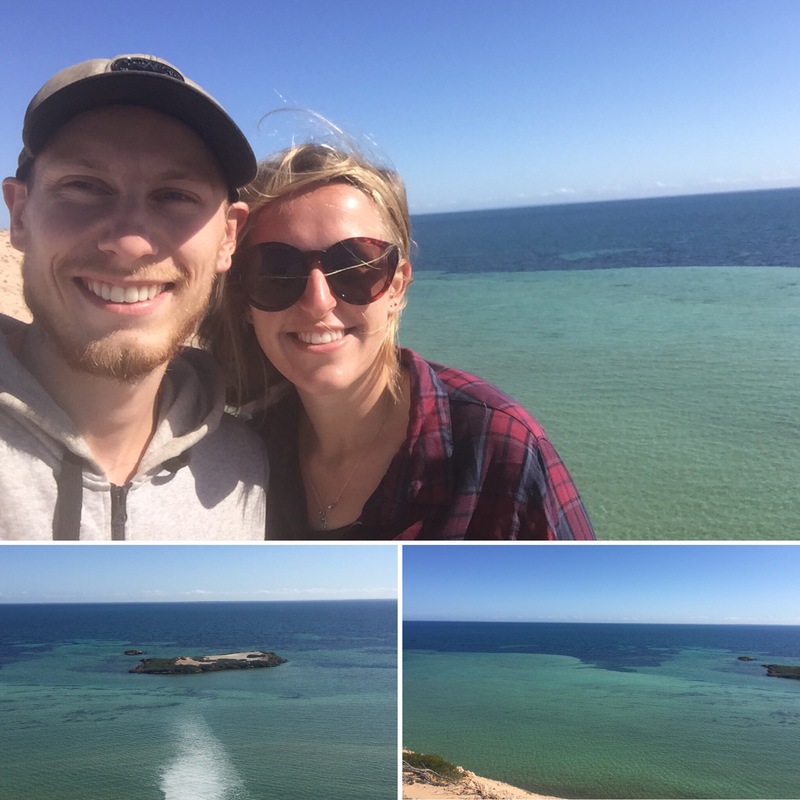 Our next stop was to Eagle Bluff which is a look out point off the coast which is known to be a good spot for seeing a range of marine wildlife. It was very windy here but it was worth being blown about as we ended up seeing a dugong, sharks, sting rays and a turtle! The water was so clear even from as high up as we were over the water. 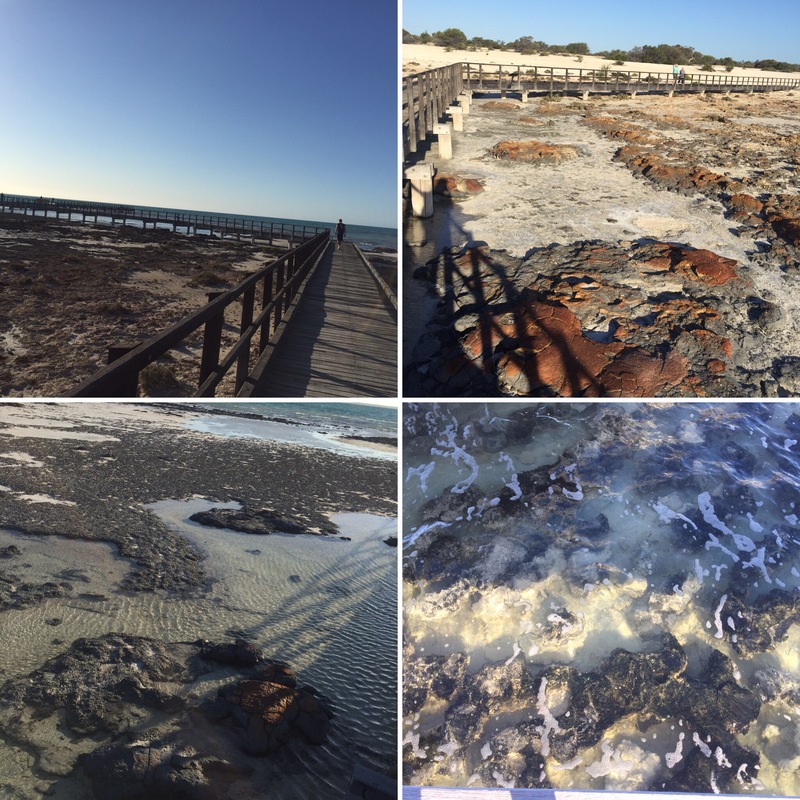 Our last stop before camp was to the Stromatolites. The ground is covered in little communities of microscopic life forms that, in certain conditions, trap particles and create stone. This sometimes layers up to form stromatolites. It is said that these areas of microbial organism can survive longer than any other organism – such as in the event of an ice age. I can’t fully get my head around it but I think that’s the gist of it. Due to the natural activity in this area, the sea can reach temperatures of 45 degree celsius between December and March! The sea is twice as salty as in other places so it’s not somewhere you’d likely go swimming and not much life can survive here. We were here as the tide was coming in so I think it’s slightly more impressive when the tide is out and it’s not half submerged by water. 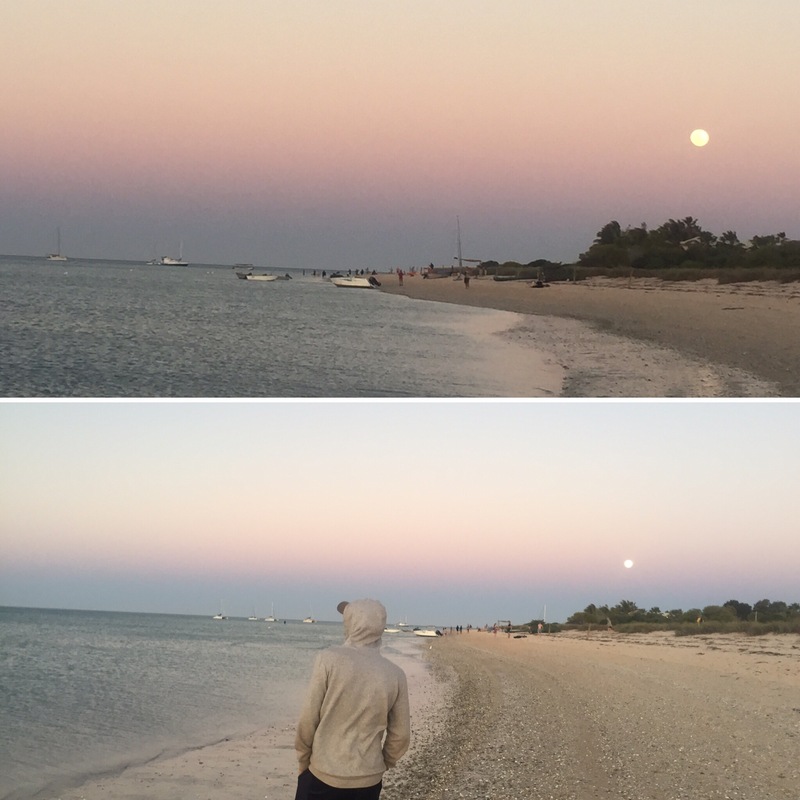 Shark Bay and Monkey Mia was a lovely couple of days for us. Seeing the dolphins so close and in the wild was amazing and we won’t be forgetting it in a hurry. 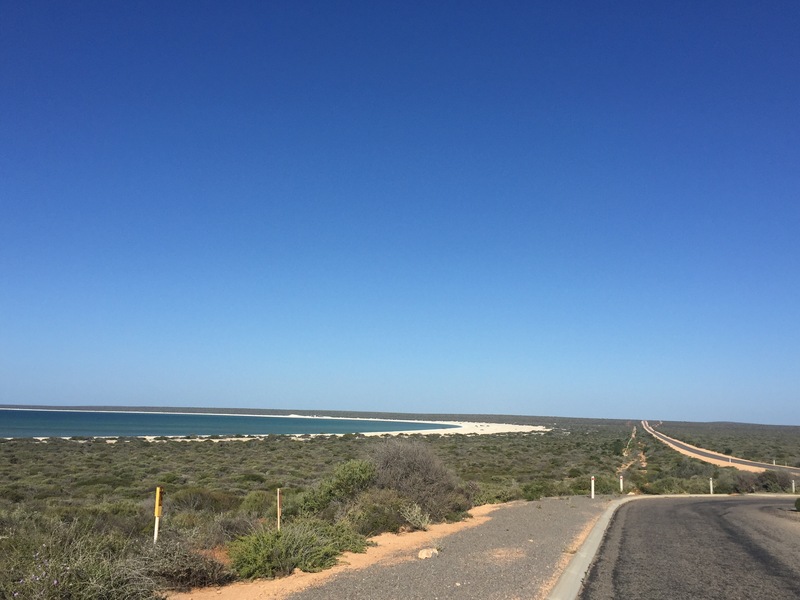 Shark Bay is beautiful and definitely deserves a day or two of your time if you’re going that way – even if you weren’t bothered about the dolphins!